If you would like to make a kitchen, vanity, or laundry room cabinet area look better, colored countertop or cabinet caulking is a great place to start. For Formica (or, “plastic laminate”) parts there are companies that match the caulk to the mica. Local cabinetry hardware supply companies usually carry a selection of these that can be purchased on site. Because there are hundreds of selections in plastic laminate from companies like Formica, Nevamar, Pionite, and Wilsonart your local supplier will only have a few of the most popular selections available. But don’t be discouraged if your Formica caulking colors are not in stock because you can custom order exactly what you need. I have literally been into hundreds of homes where the cabinet installers used a light color such as white, almond or antique white next to darker areas. In this day and age that we live in the Internet is a great resource for purchasing this item. There is a company called ColorFlex. This is a great company to buy caulk for plastic laminate cabinets or counters from. They have a chart that matches the Formica, Pionite, Nevamar, and Wilsonart plastic laminate colors to the correct caulking product number that you will need to order. Tip: If the filler is going next to white or off white walls do not use a color that matches the cabinet or counter. White looks best with white walls. How much does colored mica caulk cost? Generally a small 4oz tube of colored mica caulk costs anywhere between $8 to $12 dollars. Some companies carry the larger size tubes which are ten and a half ounces designed to fit into a standard sized caulking gun. These larger tubes of caulk to match mica generally run about $18 to $24. Tip: Be very careful with this substance when you are using it next to walls. If you tend to get large amounts in textured areas you are going to spend a lot of time trying to remove it from the creases and crevices. Actually even small amounts will be difficult to remove from painted walls. You must get it off immediately. By using colored caulking on your kitchen, or vanity cabinets you will obtain professional results. If your cabinetry installer/manufacture takes the time to purchase the caulk to match your plastic laminate then the result of their efforts is going to be a nice looking installation. 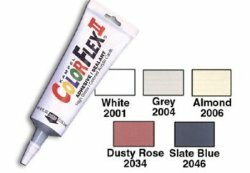 ColorFlex caulk for Formica, Pionite, Wilsonart and Nevamar plastic laminates is the brand name that I recommend that you purchase. The cost of the colored filler for cabinetry areas is well worth the investment. There is nothing that looks worse than a dark colored cabinet or counter top that has a light caulk bead on it.